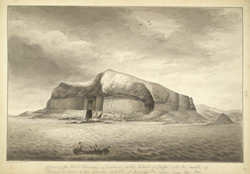 View of the Erect Columns & Causeway on the Island of Staffa with the mouth of Fingals Cave & the small island of Booshala [Buachaille] taken from the sea, drawn by John Frederick Miller in 1772. The island is situated between the west coast of Mull and the Treshnish Islands and is well known for its caves and hexagonal basalt columns. The basalt columns are the result of volcanic activity although one legend holds that they were formed by a giant who had brought a segment of the giants causeway from Ireland as a gift for his wife but a small piece fell out as he travelled home to Scotland. The unusual island is also known for its 5 caves of which Fingal’s cave is the largest. The cave's Gaelic name is An Uamh Binn which means 'The Melodious Cave' and it is thought Mendelsohnn composed 'The Fingal's Cave Overture' in 1832 after visiting the island.